So, I'm still in the party planning mode and no signs of stopping anytime soon. I went to Michael's and Target in search of art supplies. One of my plans for Nate's party, is to have an arts/crafts table for the children to get into. Simple things like coloring, painting and drawing. Well I totally scored. While at Target, I came across some Art Skills supplies...on CLEARANCE! Needless to say, I stocked up! My Michael's find was the best of all! Paint containers, decorated in colorful stripes and shapes. I originally thought of using them for my candy "bar" but I think they will look great for my art table instead. 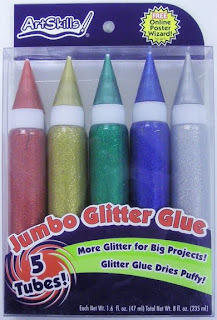 Filling them with all the supplies the children will need, will definitely make the table fun and colorful. So I plan on filling them with crayons, brushes, markers, my glitter products and maybe even the unfinished wood pieces, that they will be painting. I got these at Michael's as well. Just a few in this picture, my basket was FULL of these kind of pieces. All cost $1 each. Now I need paint...heh!